Place chicken in a large pot and fill with just enough cold water to cover chicken by about 3 inches. Add cilantro stems and roots (reserving leaves), carrot, onion, bay leaf, peppercorns and ginger. Set over high heat and bring to a boil. Reduce heat and let simmer until chicken is cooked through, about 1 hour. Remove chicken from liquid and let stand until cool enough to handle comfortably. Combine cucumber and onion in small bowl. Add vinegar and let stand to soften. Zest 2 limes and squeeze juice from all 4. Finely chop reserved cilantro leaves and rau ram. Remove chicken from carcass and shred. Place meat in a bowl. Add lime zest, juice, chopped herbs and soy sauce. Adjust seasoning as needed with more lime juice or soy sauce. Cook sticky rice according to package instructions using some of the chicken broth (strain and reserve remaining broth for another use). 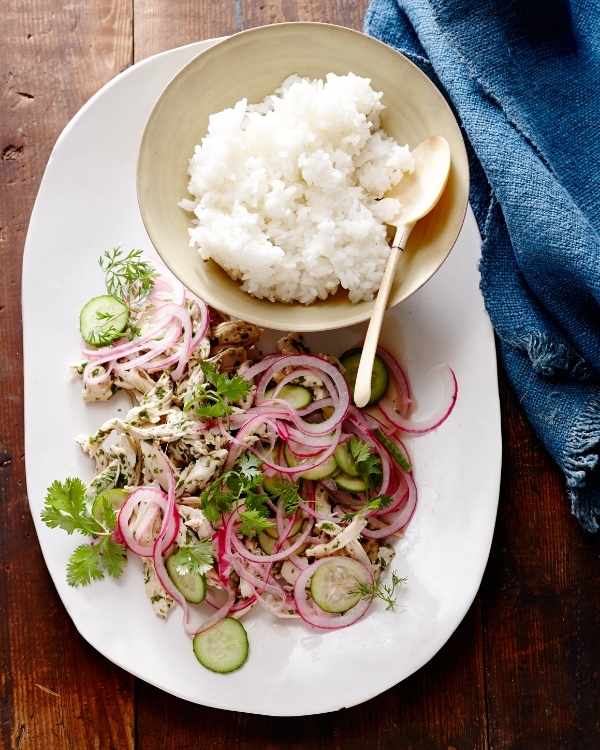 Serve salad with pickled cucumbers and onions and a generous portion of sticky rice.